Looking for Hawaii real estate? Welcome to Hawaii Relocation. Let our friendly and experienced staff help you find a place to call home on Oahu. Visit our relocation and Honolulu Community resources to find out more about living in the islands, schools, government and services available to residents. Go directly to Homes for Sale to view the latest MLS Oahu real estate listings, or contact a us for more information on home sales in Honolulu. View Homes For Sale. Hawaii homes for sale, Molokai Real Estateand Lanai Real Estate.Try our new Condo Search where you can search by condo building. Hawaii Island Luxury Condos Kona Real Estate. The Big Island's top luxury condos include some along the Kona Coast. Kona Coast Resort, for example is conveniently located across from the Keauhou Shopping Village, adjacent to the Kona Country Club Golf Course, and boasts two pools, three Jacuzzis, a sauna, tennis courts, and much more. The basics of effective property. management. How to go about a property sale without the hassles. The basics of real estate revealed in a nutshell. The challenges and rewards of a real estate broker . Great reasons why real estate agents are needed . The challenges of a real estate agent. Are you ready to manage a rental property? Kuilima Estates real estate at Turtle Bay Resorts for Vacation Condos. The Hawaii market is based on the chain of supply and demand. The Honolulu real estate market has however experienced a limited supply but a very high demand. This could be attributed to people's fascination and passion for Hawaii and holiday making in Hawaii, thanks to the pristine natural beauty that surrounds the environs. In an effort to protect that natural beauty, re-zoning across Maui, Oahu, Kauai, and the Big Island are wide spread. The economy in Hawaii is today diversified more than ever before. A few years back, business leaders of Hawaii in partnership with the government determined that it was desirable and important to create some form of diversity in the economy. After military and tourism spending, Hawaii real estate emerged a huge portion of the economy characterized by high-rise condos development and land subdivision; it has been booming business. This has contributed to the influx of new residents and individuals who wish to spend most of their valuable time in Hawaii. Being strategically located in between the US and Asia, investors will always get comfort from the financial markets and laws of the US and get access to the resources and capital from Asia. What this means is that in most real estate cycles, while the US undergoes a down period, parts of Asia remain very strong, one reason why Asian investors should remain upbeat. The Asian economy is equally very strong, and a very positive currency swing to the advantage of the investor is another reason why an investor should be bubbly when thinking of making an investment in real estate. The situation can replicate itself in most countries, thus allowing investors to remain strong while driving investments in Honolulu. Most of these investors are those who are planning for retirement by buying a piece of real estate investment for their future. Young financiers from Asia who spend some months in a year in Hawaii are another crop of investors attracted to Hawaii. Such investors have started to become active in the community, by giving back to local charities and not overusing the resources. Of course they contribute by paying real estate taxes. Simply put, there are a myriad of reasons as to why you should invest in Honolulu. Every island in Hawaii will have their own individual reasons for why someone will want to buy real estate in those areas. The weather is great all over Hawaii all year round, so that will most likely not be the reason. However, there are several variations in weather depending on what part of the island a person is on. Nearer to the ocean will give much cooler temperatures. Places more farther out from the ocean will have much warmer temperatures. If a home buyer makes a decision to buy a home near the beaches, it could be that they love the cooler temperatures. Finding the right home may have everything to do with the weather, especially if someone is making their decision based on weather conditions. It is a good idea to know the different weather patterns on each island. Some will get more rain than other parts of the islands. Other islands will get more dry weather and heat. If a person wants to live in a more wetter climate in Hawaii, it would be a good idea to look for real estate in those areas. Kauai is just such an island. The rain that it receives throughout the year has made it some of the most lushest and green rainforests that gave it its name of Garden Island. The whole island from Hanalei, Kapapp, and Poipu are filled with lush green tropical rainforests. This would be the ideal place to live for people who count on wet climates. The farther west that people go, the weather climate will change drastically. The west side of Kauai is as dry as a bone. The west side consists of Kekaha and Waimea. The climate in this area is much drier and does not have the lush green tropical forests. The microclimates in Hawaii are mystical. It could be raining in one area, but only five miles away it is as dry as a desert. The bigger islands of Hawaii are effected by many climates. 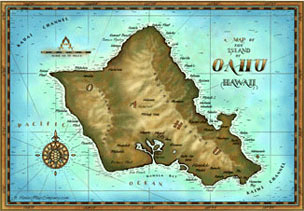 Kona is just one of the islands that are a part of a bigger island area. Kona has a totally different climate than most of Hawaii. It does not rain much at all in Kona, in fact the coffee industry that Kona is most known for could not survive with anything more than a small gust of wind. Most places in Hawaii experience more than just minor gusts of wind, but because Kona sits next to the Mauna Loa volcano, it is protected by its largeness. Mauna Loa keeps most of the wind away from Kona. That is why the area was chosen for its fields to grow coffee plants. The wind must travel a long way up the Mauna Loa mountain to the other side. By the time it reaches Kona, the wind has lost all of its power. The mild gentle breezes that the Mauna Loa turns the wind into is what helps to cultivate the coffee fields. People who are looking to buy a home may choose Kona for the mild gentle breezes. The great thing about buying real estate in Hawaii is that there will be a micro-climate for every island. People can pick and choose their favorite climates and buy a home in those areas. Real Estate Agents are experts on the climates in Hawaii because that is all a part of their selling points. Finding a Realtor who knows all about the best climates can help people find the best home in the best climate areas.